ECRL – Milestone or tombstone? The recently launched East Coast Railway Link (ECRL) project has been hailed as, a game changer; that it will most certainly be but not in the way that many expect. The ECRL now ties us to China in a way that jeopardizes both our political sovereignty and our economic future. It signals not only the ascendency of China in our national affairs but the stark failure of all our national institutions to safeguard our independence and sovereignty. It is the ultimate triumph of self-interest over nationalism. Whichever way you look at it, the ECRL is simply bad for Malaysia. It is based on exaggerated claims, unrealistic assumptions and terms that bring little benefit to Malaysia. The government is projecting, for example, that demand for freight capacity along the east coast corridor will rise to 53 million metric tons by 2030. How realistic is this given that the entire KTMB network today carries no more than 6.5 million metric tons annually? For freight demand to rise to the level the government is projecting, the east coast states of Kelantan, Terengganu and Pahang would have to experience an unparalleled economic great leap forward, surpassing even the present level of industrialization on the west coast in just about 18 years. If that is not fantasy economics, what is? And let’s not forget either that even KTMB, more than twenty-five years after it was corporatized, is still dependent on hefty government subsidies to survive. 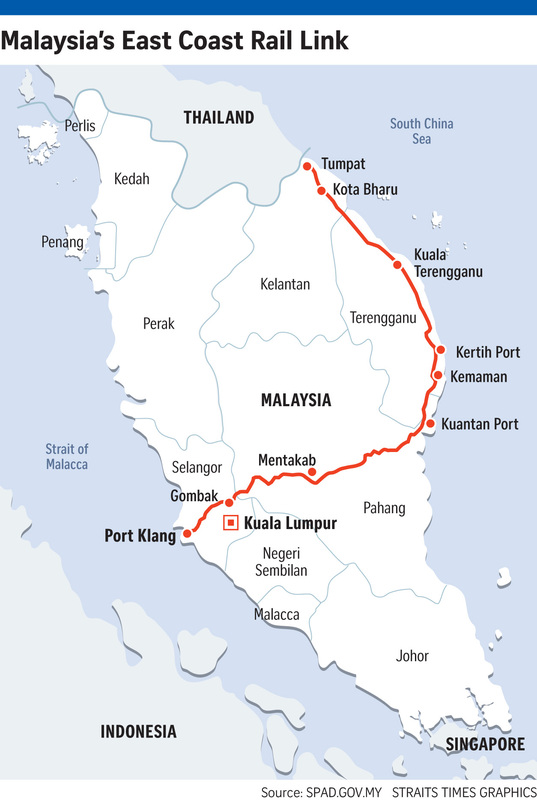 Going by some of the remarks made at the groundbreaking ceremony, the government is also hoping that the ECRL, which will connect the deep-water port of Kuantan to Port Kelang, will become “an alternate trade route” bypassing Singapore. Bypassing Singapore is, of course, a long cherished dream of certain ultra groups in Malaysia but that aside, the assumption is that the ECRL alternative is going to be competitive enough to persuade shipping companies to offload their cargo at Kuantan port, transport it by rail across the peninsula to Port Kelang and then reload it on container ships bound for other destinations. And all this to save, at the very most, a couple of days additional sailing time around the peninsula. Shipping industry sources say this is simply wishful thinking and yet more fantasy economics. Even Chinese shipping companies would be hard-pressed to justify using such a route. Perhaps that’s why China has itself shied away from making any firm commitment to use the ECRL. And what happens to the ECRL (as well as all our other expensive port projects being built with yet more PRC loans) if China and Thailand decide to go ahead with the Kra Canal project that they have been discussing for some time now? It wouldn’t be just a game changer; it would be game over for us. In terms of cost per km, the ECRL is also going to be the world’s most expensive railway project, certainly the most expensive Chinese railway project ever built abroad. Chinese railway projects in Africa, for example, cost far less. The 752 km Addis Ababa – Djibouti rail link which was inaugurated in 2016 cost RM15 billion. The 782 km Port Sudan – Khartoum railway cost RM6.4 billion. The 470 km Mombasa – Nairobi railway cost RM17.18 billion. The now abandoned 462 km high-speed railway project in Venezuela cost RM32 billion. The 668 km ECRL, on the other hand, will cost a whopping RM55 billion and that does not include land acquisition costs and the inevitable cost overruns. Even taking into account differences in terrain and other factors, the ECRL is clearly overpriced. Given the lack of transparency and our long history of corruption, one has to assume that “hidden costs” have pushed up the overall price of the project, making it even more of an eventual liability to taxpayers than it already is. Simply put, therefore, the ECRL is grossly overpriced, not financially viable and destined to become perhaps our costliest, most disastrous infrastructure debacle to date. It is also doubtful that Malaysia will gain much in terms of spinoff and other economic benefits. 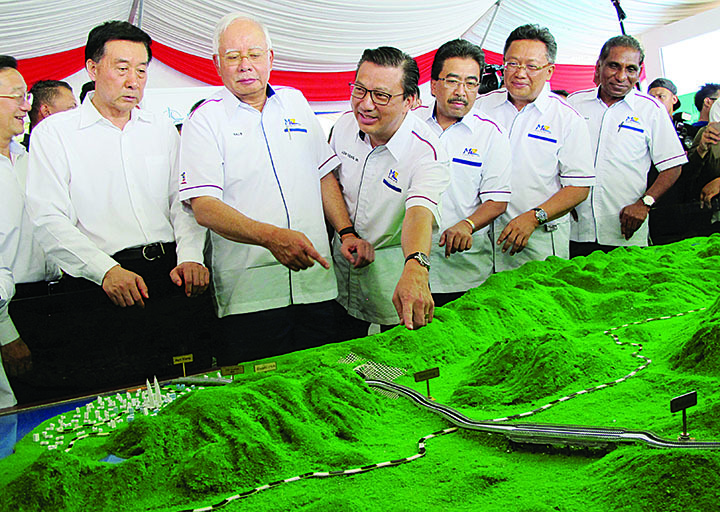 In exchange for concessionary loans, Malaysia has had to surrender overall control of the project to China. Everything about the project – management, design, construction, technology, material, rolling stock and other equipment as well as a significant part of the labour force – will end up being sourced from China. Of course, there will be the usual token local participation, all cleverly structured to provide the illusion that the project will create good local jobs and provide a huge boost to the local economy. The reality is that Malaysian companies, labour and suppliers will be largely sidelined. In the end, the ECRL, like other PRC projects in Malaysia, is all win-win for China. It prioritizes China’s strategic interest, enhances China’s energy security, improves China’s lines of communication in the region, helps absorb China’s excess industrial capacity, boosts China’s exports and provides jobs for thousands of Chinese citizens. And all courtesy of Malaysian taxpayers who will have to spend money they don’t have on projects they do not need to advance another country’s interests at the expense of our own. No responsible government would ever contemplate such a reckless, risky and perilous venture on such disadvantageous terms for such doubtful benefits. One has to wonder what nefarious agenda drives this headlong rush to embrace such dubious projects.